I am really looking forward to these next three reviews because they're all just made for this late spring / early summer weather. Look at that bottle. That condensation isn't even from the bottle coming out of my fridge... it's from my basement. It's hot outside here. Finally. All three wines are from CVNE, which stands for Compañia Vinicola del Norte de España. Well... at some point somebody hit the wrong key of a typewriter or something and put in a U instead of a V. The mistake stuck. It's mostly known as CUNE and pronounced coo-nay. The winery was founded in 1879 in Haro, Rioja and has been a leader in progressive winemaking and modernization since its inception. I've got two rosados and a blanco. Viña Real 2015 Rioja Rosado, CVNE Monopole 2015 Rioja Blanco, and Cune 2015 Rioja Rosado. What better way to quench your thirst and celebrate the next few months of not having to wear a stupid jacket than some refreshing Spanish vino? 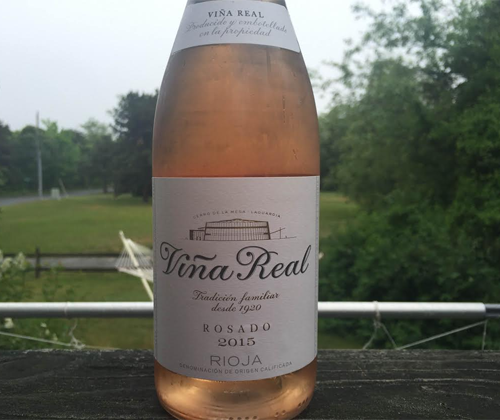 The 2015 Viña Real Rosado is 85% Viura and 15% Tempranillo. So it's mostly a white with a little red, rather than red with little skin contact. I'm not sure if the grapes are crushed together, or if the must is blended and then fermented together, or if it's all done completely separately and then blended. But I do know that there's a six hour skin maceration somewhere. So there's that. The package is beautiful. Clear glass, Burgundy shaped bottle, and a white label with black and gold leaf. Also, screwcap. It has an elegant package that brings attention to both the product name and the gorgeous coral pink color of the wine. There's very specific aromas that I wasn't expecting that popped up immediately on the nose: red roses and snapped celery. Beyond that there's anise, tequilaless strawberry margarita and citrus gum. Ever actually had citrus gum? It looks and smells appealing but once it's in your mouth it's disappointing and unsatisfying and meaningless. Stay away from citrus gum unless you wanna turn into a nihilist for the rest of the day. 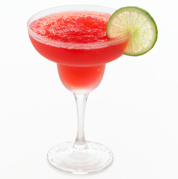 That tequillaless strawberry margarita is the driving force on the palate. Lime juice with a splash of "strawberry" flavoring is I guess what I'm trying to say. It finishes with tart acidity and a touch of tannin. But that's about it. There's no complexity on the palate and that's not necessarily a bad thing. It's just a bottle of rosado that you could cheerfully down all by yourself in a good 15 minutes if you're not careful. I've got no problem with this bottle of wine whatsoever, and I have no problem with the price point of $15. Are there better ones out there at the same cost? Totally. But I can't see anybody being let down by this one.